Jedi Knights are a lot of things. On any given day, they could be diplomats, soldiers, detectives, or mentors. Someone has also got to be running the dining hall in the Jedi Temple, and since you can bet your bantha it's not the big shots like Master Kenobi or Windu, that means some poor Knight is out there flipping space-pancakes, too. Like Yoda always says, "For the Jedi, it is time to eat, as well!" One thing the Jedi aren't, though, is subtle. Since part of a Jedi's strength comes from their mystical and dangerous reputations (and the rest comes from being actual lightsaber-swinging space wizards), they can afford to draw a little attention to themselves. That doesn't mean you should dress up in flashy bright colors if you're planning to pull off some Jedi style. 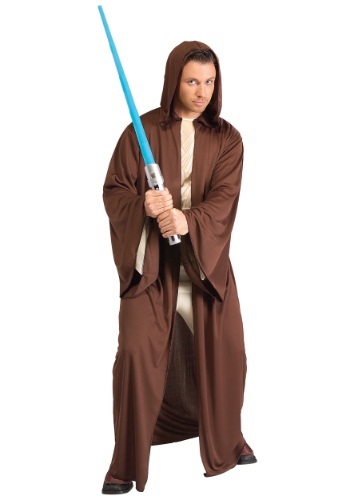 You just need to throw this Plus Size Jedi Robe on over your other clothes. With the big sleeves and draping hood, you can stand out just as much or as little as your current situation calls for!